코리아포스트 모바일 사이트, Top diplomats of U.S., Canada discuss keeping pressure on N.K. The top diplomats of the United States and Canada met in Washington this week and discussed maintaining pressure on North Korea over its nuclear weapons program, the State Department said Thursday. U.S. Secretary of State Mike Pompeo and Canadian Foreign Minister Chrystia Freeland held talks Wednesday on the sidelines of a ministerial meeting marking the 70th anniversary of the North Atlantic Treaty Organization. 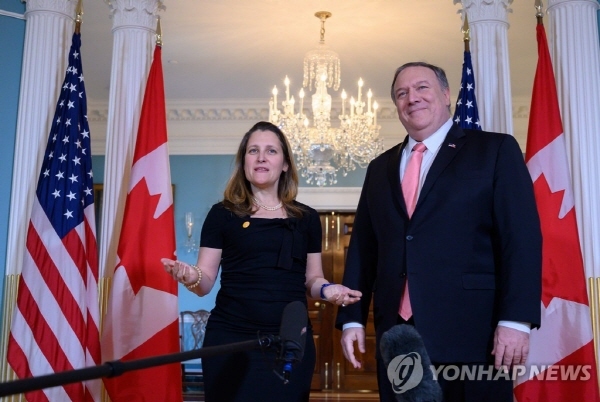 "The Secretary ... thanked Minister Freeland for Canada's consistent support to international efforts to maintain pressure on the DPRK," the department said in a statement, referring the North Korea by its official name, the Democratic People's Republic of Korea. Canada is part of a coalition of nations conducting surveillance activity to stop illegal ship-to-ship transfers of oil and other goods to North Korea.